As we pull out of the Petco parking lot with Emmy in the back in a crate, she starts to whine, cry and dig. 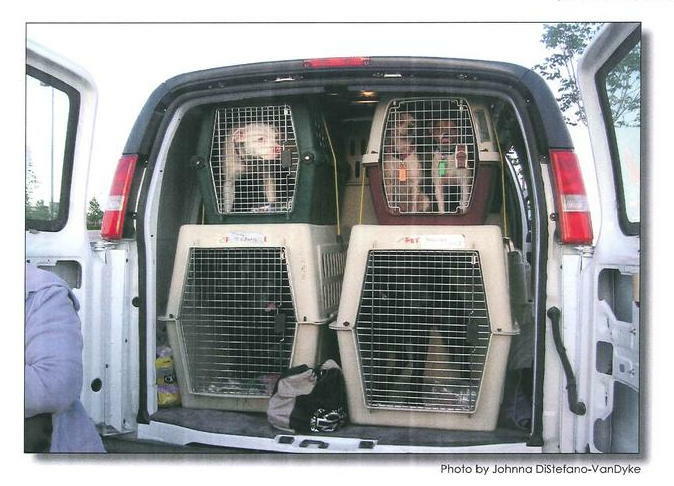 Alan and I just look at each other with the silent thought, “I hope that doesn’t continue the entire way home.” One can only imagine what it must have been like for the transport vans with 20 dogs (+/-) in each one coming across Kansas. My guess is once the initial miles are laid and the vehicle settles into the hum of the road, the dogs all quiet down. Sure enough, that’s exactly what Emmy does within ten minutes of our departure. 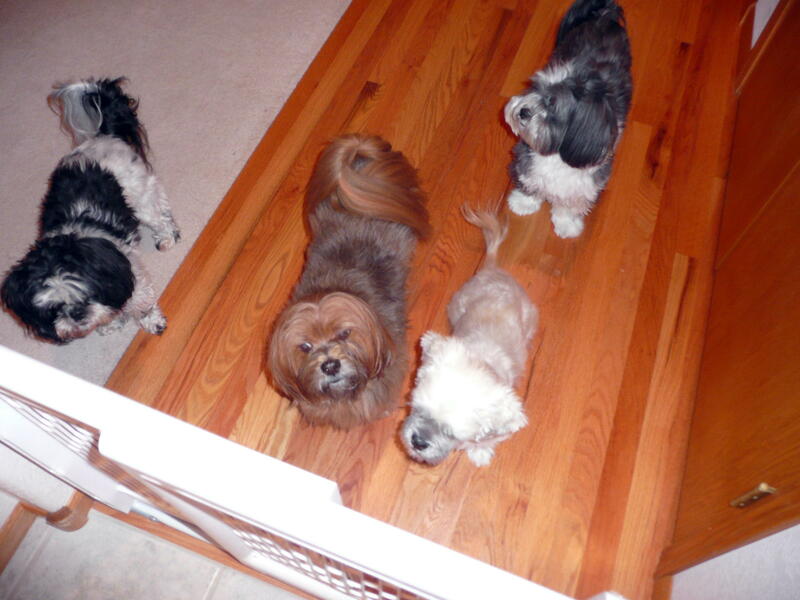 Upon arrival at home, our dogs are run outside, given potty treats and allowed to calm. Because we have prepared for Emmy’s arrival before we left, getting her into the house and comfortable is a matter of long-established routine. She’s taken outside on a leash and walked in the yard until I know she’s fully toileted. I bring her in the house and she goes into a wire crate in the front room that’s covered on three sides with heavy towels. While I’m getting food and water set up in the crate, the other dogs slowly check her out. Ali and Frankers are old hands when it comes to integrating fosters into the pack. As long as the new dog is well socialized with other dogs, there are few problems. The house turns in for the evening around 10:30 p.m. and Emmy is moved to a crate in our bedroom. She goes in with no fuss and — to our surprise — sleeps the night through. That certainly can’t be said of all new fosters! The next morning Emmy is fed along with the rest of the dogs in the kitchen … she’s ravenous and quickly cleans her bowl up. Not knowing what she’s been fed, how much or what her digestive status is, I start her out slowly. What I don’t want is to overload her system with quality food, causing a bout of diarrhea. A call is made and she’s lined up for her rescue exam in two days … exam, heartworm test and dewormed at a very minimum. I take photos to document her condition. Because I was advised Emmy appeared to be housetrained, she is allowed to be off leash (tether) in the house the next couple of days. Also making the freedom possible is the fact she sticks to me like glue so monitoring her toileting habits is easy. She’s plumb wore-to-the-bone tired and spends much of her time sleeping. Between running the streets for who knows how long in Kansas, the malnutrition and a stressful trip across two states, there isn’t much energy left in this little dog. The second night she disappears from the office where I’m working. Ever mindful of the ongoing toilet training, I go looking for her and this is what I find … she’s found the best spot in the house. Imagine the long sigh that surely had to come from her as she settled into the down comforter and slipped into a peaceful sleep. During the rescue exam on Friday, it’s found that both eyes are infected. Not a surprise given the redness present or the fact she’d not been groomed regularly (if ever at all). She’s a good girl and patiently endures the poking, prodding and blood draw for a heartworm test. Our biggest surprise, however, was finding out she’s in heat!! Alrighty then … will have to let hubby know that under no circumstances are Dante and Emmy to run together. And if it does happen, then he’d best be getting his hands on one of them pretty damn quick! Will be interesting to see how Dante — as an intact male — handles himself while she’s in heat. 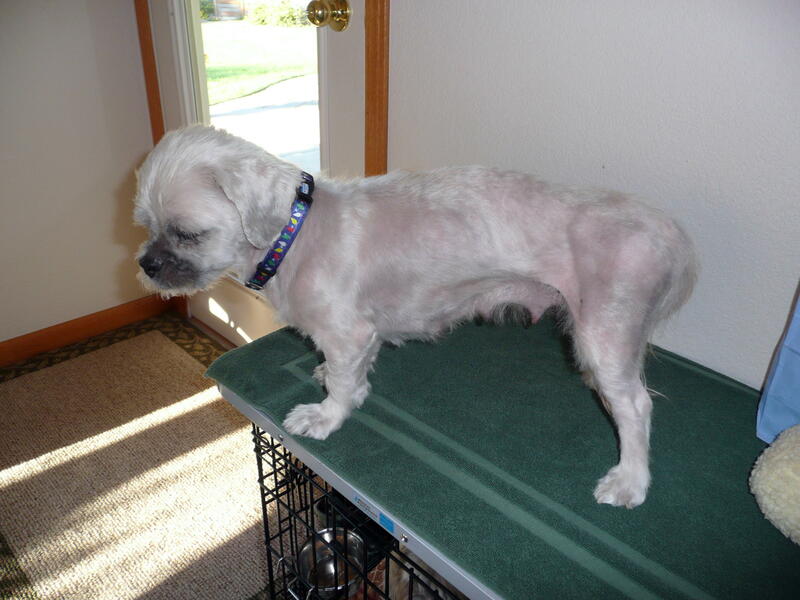 Because of Emmy’s severely emaciated condition, she can’t be spayed any time soon. Better that she’s in heat now while we’re fattening her up than in three to four weeks when we go to spay her. Over the next three weeks, Emmy settles into the household routine. Within a week, I start seeing sparks of what her personality is … she loves to play with toys, will race around the yard just for the joy of it, and gets along with the rest of the pack. She really is house trained as well as crate trained so the transition is pretty uneventful. Since she’s not gaining weight as quickly as I’d like, I end up at the local feed store in search of a high-fat/calorie puppy food. I hit the jackpot … they’re very generous with their samples packs when I explain what I’m looking for and why. I begin to see a “softening” of her bones as she starts to fill out and is further substantiated when I pick her up … she’s definitely gaining weight! I keep telling her she’d better hurry up and grow some hair, too, as winter is on its way. This is so sad. Is Emmy still in your care? Oh, no, not sad! 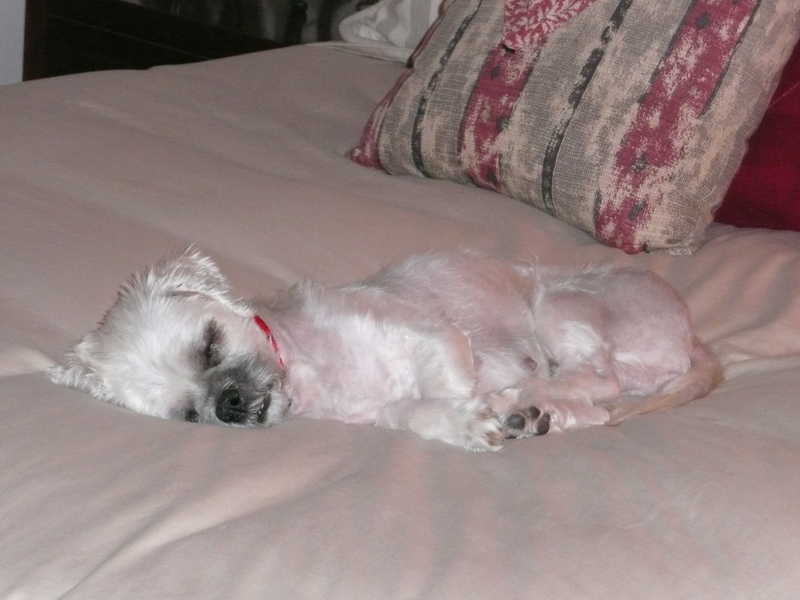 Emmy is one of the lucky ones … she made it into rescue and a chance at a new life. She is still a foster in my home … and will be for at least two weeks after her spay so I can monitor her recovery. She’s an easy keeper and will remain here until just the right home is found for her. Our goal in rescue is to place the dog in the home most appropriate for the dog … a home where he/she can live out the rest of his/her life.